If you have ever run over a power cord with a lawnmower blade, you know it’s a pretty ugly thing. If it doesn’t immediately blow the fuse in the house, then you are left with tangles of sparking wires gnarled around a sharp lawn mower blade. 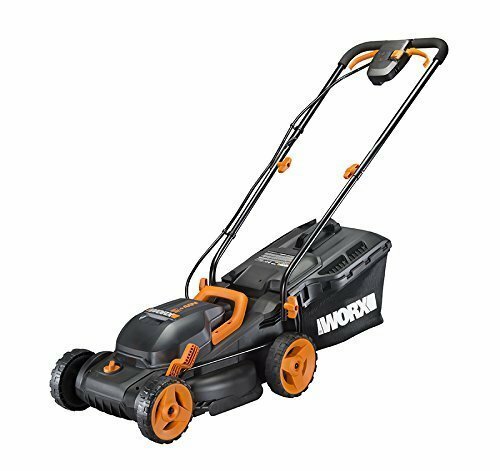 Thankfully, new advancements in battery technology and overall battery life have made battery powered electric lawnmowers like the Worx WG779 possible. It uses a pair of 20V Worx batteries that can be interchanged with other 20V Worx batteries from other devices or power tools in their line. Worx also designed the WG779 with a port charger. This means you don’t have to take the batteries out every time to charge them, you simply plug the port in to a standard wall socket. The integrated charger is also a smart charger. This might not seem like a big deal at first, but there is a real danger in overcharging batteries. Even if you forget to unplug the charger once the batteries reach the max, the smart charger reduces to a maintenance trickle charge, which is designed to keep the batteries optimized without adversely affecting them. 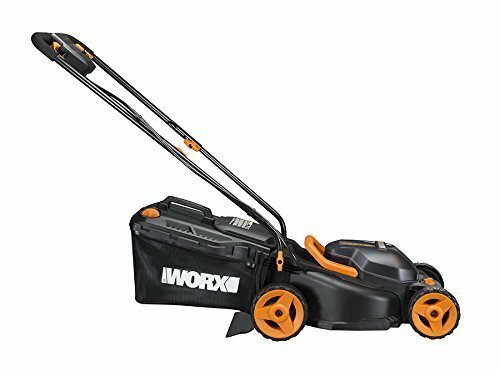 The Worx WG779 Cordless Electric Lawn Mower was designed to be lightweight and durable. This means you aren’t going to have to wrestle it around if you need to cut close to edging or you need to cut around a tree. It is rated to mow up to 5,500 square feet on a single charge, which is right around 1/8th of an acre. 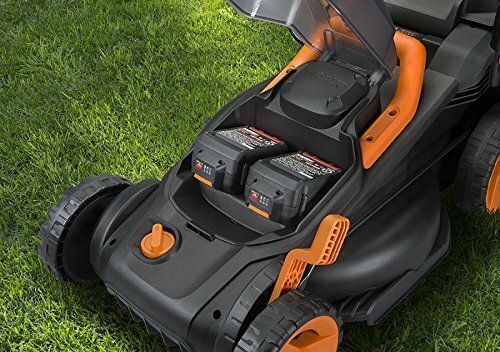 If you have extra batteries, you could charge them for extended mowing time. 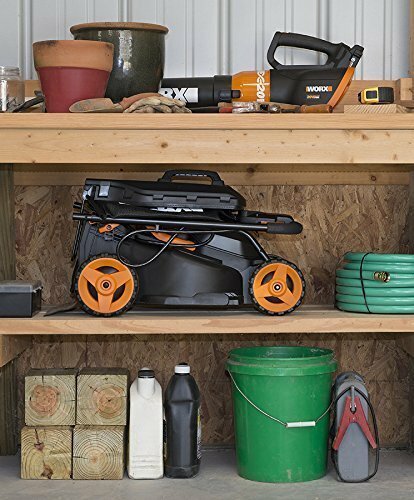 The built-in port charger with smart charge technology means that this mower is always ready to get to work. It’s also lightweight, which means its nice and nimble. The padded handles with comfort grip and easy switch controls is also a nice touch. It is also easy to change the height of the 14-inch mower deck. There is a single lever switch that allows you to adjust between three different height settings, 2-inches, 3-inches, and 3.5-inches. One pull or push of the lever sets all four wheels, which spares you the tedious hassle of having to adjust the height of each wheel at a time. 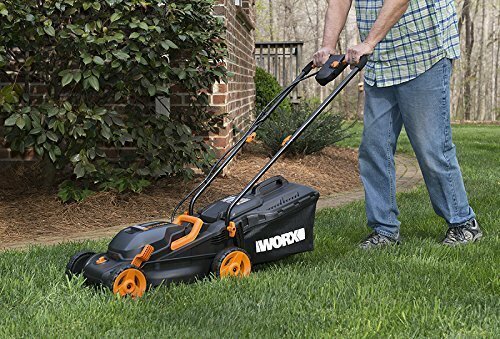 The Worx WG779 Cordless Electric Lawn Mower is lightweight, which means that it is also very nimble. If you have a large yard or even a small yard with a lot of wide open spaces, then the WG779 might be a little bit on the small side. However, where it shines, is for small yards, that have a lot of landscaping features, contoured edging, and trees. The nimbleness and light weight of the WG779 allows you to work around these turns with ease. To the point that you might not even need to pull out your weed whip after you are done mowing. Just like all lawnmowers, you need to be mindful to keep the blade sharp throughout the season. Give it a good look over in the spring, for any chips or dings. If you notice a problem, you might want to have the blade professionally sharpened. A dull or even slightly damaged blade can struggle to cut grass efficiently, which can increase cutting time and even eat through battery power during a mowing session. If you prefer to bag your grass clippings, you need to make sure to clean it out right after you finish cutting. Excess grass left in the bag could quickly decompose. It can be a little hard to clear away damp grass clippings that get trapped in the back. The port charger with smart charge technology helps maintain the battery power without having to monitor it or unplug it. If you live in a place where the winters get cold, you should strongly consider taking the batteries out and bringing them inside, as prolonged cold can reduce overall battery life. During the winter it would be wise to plug the batteries in and charge them back up to full once a month. The padded handles come with easy switch controls. If you release them in the middle of a mowing session, it will arrest the mower blades. The built-in port charger that also has smart charging technology to prevent overcharging and battery damage. Easy to operate switch controls and padded handles for added comfort. 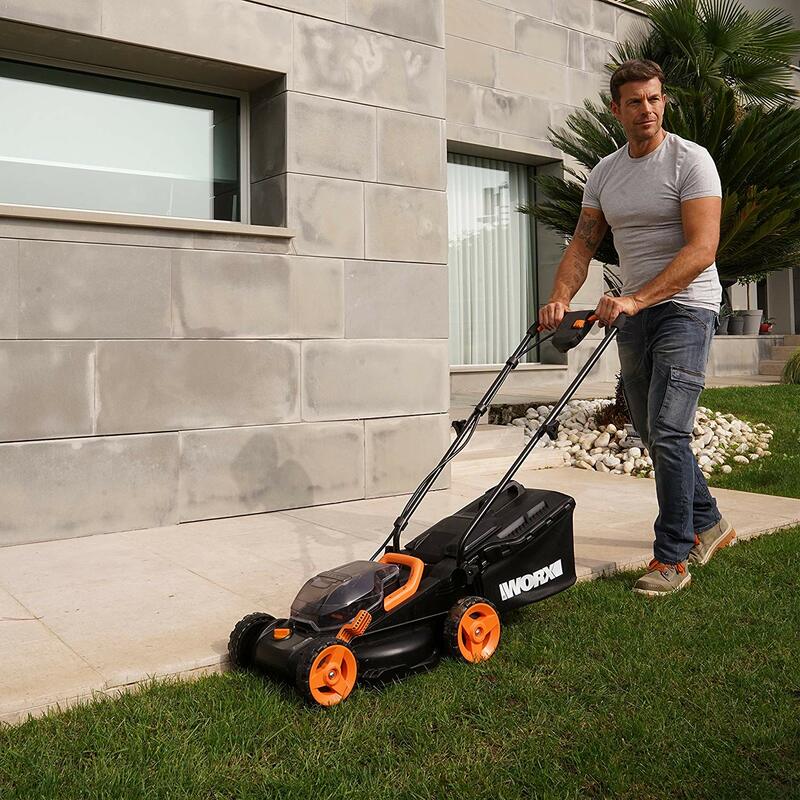 The nimbleness and lightweight of the Worx WG779 makes it ideal for small lawns with a lot of trees and features that need to be carefully mowed around. With a little bit of luck, you might not even need to use an edger or a weed whip to clean up afterward! There is also some potential cost-effectiveness in the batteries. The built-in charging port with the smart charge will help maximize battery life and prevent damage from overcharging. At the same time, the two 20V batteries are interchangeable with other 20V tools and appliance in the Worx line. 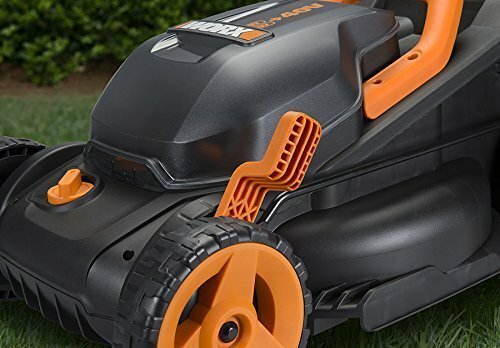 This means if you are a fan of the brand already, you could use other batteries to get even more mowing time, or you could multitask the batteries from the mower to operate your other power tools. 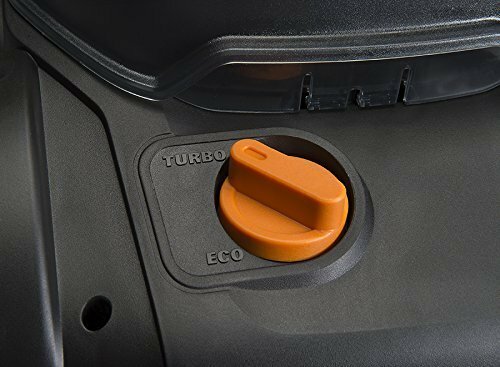 The ability to switch between turbo and eco modes can also save battery charge. When used responsibly, you could even extend overall battery life. 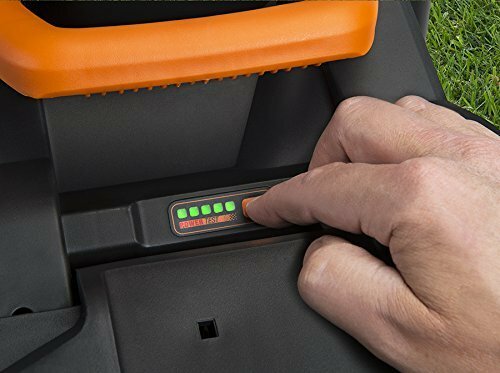 For example, if you have a thick lawn, or you’ve gotten a little behind on the mowing, setting the Intellicut system to turbo mode on the 2-inch height setting might strain the batteries as the blades try to chew through.